German and Polish students conducted interviews with people who had been expelled from their places of birth in Lower Silesia and East Poland after the end of the war. These encounters were videotaped, and became documentations of the personal memories of the contemporary witnesses. At the end of the project the students met to get to know each other, exchange experiences, show the videos to each other and discuss them. "I was deeply impressed by the openness of these elderly people towards us! They had a phenomenal memory and told us about their lives as if it were the most natural thing in the world. What affected me most was the fact that these people were at our age when they were expelled, and that we are so well off today compared to them." "We got to know the memories of these people, and that is totally different from learning things from a textbook." The project aimed at presenting the topic from the perspective of the young generation and at facilitating comparisons, by using video recordings of encounters between contemporary witnesses and young people. Eleven students from Leipzig were selected for the project to interview German expellees who had left Lower Silesia after 1945. Eleven students from Marcinowice (woj. dolnośląskie) met Polish expellees from the former East Polish territories who live in Dolny Śląsk today. The project was advertised in various schools in Leipzig and in the local newspapers. Those interested to participate then came together for a first meeting at the Polish Institute. The Polish students were from a high school in Marcinowice that had been invited to take part in the project via the school management. Students' participation in the project was voluntary. 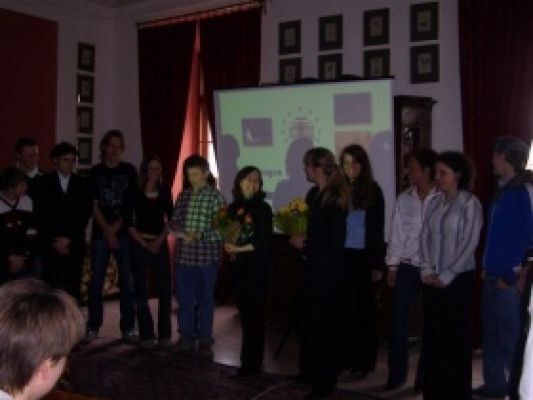 Between October 2004 and February 2005 two groups of 15 to 16-year-old students took part in introductory courses on the history of German-Polish relations outside of the normal school lessons– one in Leipzig and one in Marcinowice. These courses provided the basic knowledge that the students needed in order to understand the implications and consequences of the Second World War for both countries in the further course of the project. Up to that point, students on both sides had only a very limited knowledge of the history of their respective neighbouring country. History lessons were largely based on the textbook "Deutsche und Polen – eine Chronik" [Germans and Poles – a chronicle] and on the accompanying films. In addition, the students prepared papers on historical and up to date topics of Polish-German relations. The history teachers at the schools involved contributed to the special lessons at the Polish Institute and at the school in Marcinowice by providing opportunities for the project participants to present their experiences to their class mates. The co-operation between the project co-ordinators and the school management proved to be very important and very successful, because the active support by the school prevented the students from perceiving their engagement in the project as a mere "leisure activity". At the same time, an introduction to film making and camera techniques took place in Leipzig and Bautzen. It was provided by the Saxonian Channels for Training and Testing (see http://www.saek.de), a support organisation initiated by several private radio and TV channels to promote media competence, including a special focus on schools. This course made it possible for the students to produce their own recordings of the interviews with the expellees. The film course provided the participants with insight into all stages of making a documentary and enabled them to carry out and finalise the project independently. Starting from December 2004, the history courses concentrated on the consequences of the Second World War and in particular on the expulsion of Germans and Poles. It became clear that the young people found it hard to imagine that national boundaries can be shifted and to understand the implications of shifting the German-Polish boarder to the west ("Westverschiebung"). German as well as Polish students had hardly had any prior knowledge about the topic of expulsion. In the course of the weekly meetings the young people became especially interested in the hardship people had to go through during the expulsions, and also in the present dispute about a "Centre against Expulsions" ("Zentrum gegen Vertreibungen"). The students then developed their own questionnaires to be used in the interviews. They included questions which they found important from their present perspective, but also questions concerning the past and the future. The first meeting between young people and contemporary witnesses took place in February 2005. The Leipzig group met with seven selected contemporary witnesses from across Germany. For this purpose, the library at the Polish Institute had been turned into a studio. Here the students conducted the interviews with the expellees, who not only spoke about the things that had happened to them in the past, but also engaged in discussions with the students about their future in Europe. The Polish contemporary witnesses were interviewed at their homes by the students from Marcinowice. Whereas the German interviewees had been quite familiar with the approach and the discussions, the preparation of the interviews in Poland was more time-demanding. This project phase was more difficult to realise, especially as it coincided with the controversy about the "Centre against Expulsions". Different from Germany, in Poland the public acknowledgement and debate of the expulsions started only after the events of 1989. Even today, expulsions are seldom spoken about, especially in smaller towns. The challenge of the project work was a totally new experience for the Polish students, but they learned to cope with it very soon and were open for the discussion with the contemporary witnesses. In a final project phase, the students went through all the video material and did the editing. In Leipzig, this was done at weekly meetings of the entire group, in Marcinowice by an editing team. The SAEK in Leipzig and Bautzen provided help with the editing, but they gave the students free rein in the selection of material and the design. The outcome consists of two similar documentations of meetings between young people and expellees from Germany and Poland, including not only recordings of the interviews, but also comments by the students. These comments show that the students experienced the meetings with contemporary witnesses as a very special opportunity to see history come to life. The last project phase consisted of a youth exchange in April 2005. The Leipzig group took their film to Marcinowice to get to know the Polish project group and to exchange the experiences gained in the project. Both films were presented at the end of the meeting in Marcinowice. The presentation of the films was the highlight of the project for both groups and provided a connecting element. For the German students, the exchange trip to Marcowice was their first visit to neighbouring Poland. The German participants went to Poland with great interest and curiosity. The usual stereotypes did hardly play any role in the project group, which is exceptional, as was confirmed by the students themselves. The openness of both groups to participate in a German-Polish project was also proved by their readiness to get to know the partner group. The students communicated either in German or in English while staying with the families. During all activities and excursions the supervising teachers acted as translators. Besides discussing the project, the students participated in German and History lesson. They also went sightseeing in the region and visited important German-Polish memorials, for example the encounter centre at Kreisau. Although the programme of the exchange visit was mainly focused on sharing the films, it was still possible to get to know the region and the project partners. The documentation of personal memories of German and Polish expellees provided an opportunity to contribute towards coming to terms with and remembering the expulsions. Combining the use of audio-visual media and encounters proved to be a suitable method to motivate 15 to 17-year-old students to approach a topic that seemed to be quite difficult at first glance. The participants did not only gain insight into the process of making a documentary, but also carried out and finalised all necessary project tasks by themselves. All participants stated that the most important experiences were meeting the contemporary witnesses and coming together with the German, respectively the Polish, project group. For almost all German students, the exchange with Marcinowice was their first visit to neighbouring Poland. The presentation and discussion of the films was the highlight of the project for both groups and provided a connecting element. Following the youth exchange, the contacts will be continued in the form of a school partnership between the Immanual-Kant-Gymnsium in Leipzig and the Marcinowice high school. Therefore, dealing with the topic of expulsion did not only lead to a dialogue between generations, but it also brought together young people from Germany and Poland through creating awareness of their shared history.